National Dental Hygiene Month FAQs - Adelberg Montalvan Pediatric Dental PC & Orthodontics too! The month of October is National Dental Hygiene Month, which means it’s the perfect time to teach your child about dental hygiene — and how a good dental care routine now will last throughout adult years later. Here are the top pediatric dental hygiene questions, answered, so you and your child can feel confident with their oral care now and in the future. Use a toothbrush at a 45-degree angle against the gums. Brush the outer, inner, and chewing surfaces of the teeth. Brush in gentle up-and-down strokes to clean the inside of the teeth. To remove bacteria and freshen your breath, don’t forget to brush your tongue! Need help getting your little ones to clean their chompers? Check out our tips and tricks here. Is fluoride good or bad for children? Too little or too much fluoride can both affect your child. Little to no fluoride will not help strengthen the teeth to fight against cavities. On the other hand, excessive fluoride can lead to dental fluorosis, which is a chalky white to brown discoloration of the permanent teeth. TIP: Make sure your child uses the proper amount of fluoride toothpaste while brushing. What is the right amount of fluoride for my child? Fluoride has been shown to dramatically decrease a person’s chances of getting cavities by making teeth stronger! As such, we recommend using fluoride toothpaste. If your child is younger than 3 years old, brush their teeth with an amount of fluoride toothpaste no larger than a grain of rice. 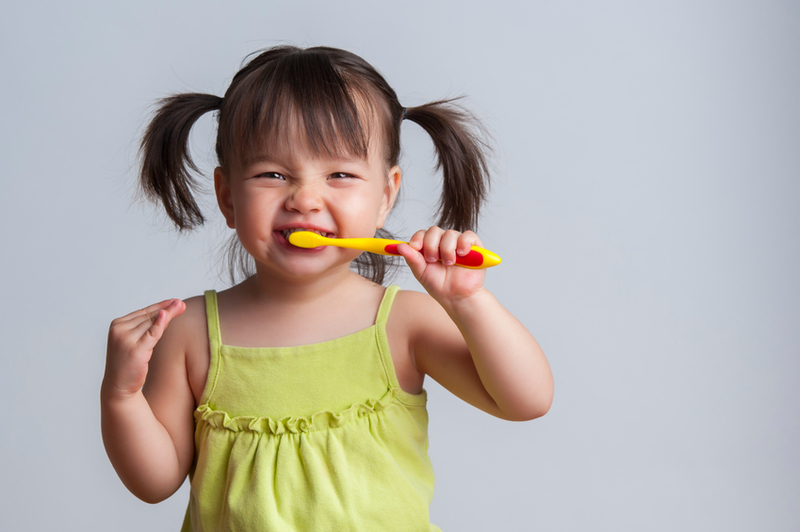 Children, ages 3 to 6, should brush their teeth with a pea-sized amount. Once children are over the age of 6, ensure they are using fluoride properly and maintaining their dental care routine daily. TIP: Teach your children right away how to spit out toothpaste rather than swallowing it. Halitosis, better known as bad breath, is caused by poor dental hygiene and plaque buildup. Remind your child to brush twice daily, floss, and rinse thoroughly in order to keep those mouth monsters away! According to the American Academy of Pediatric Dentistry, the first visit to the dentist should be by your child’s first birthday. After that, depending on the child, you should schedule follow-up visits with your dentist every six months. This allows you to have peace of mind knowing that your child’s teeth are developing properly with a clean dental bill-of-health! To help your child maintain a healthy smile, make sure they keep up with their daily oral hygiene routine — and, don’t forget to schedule your next appointment with the professionals at Adelberg Montalvan Pediatric Dentistry. We have three Long Island locations that specialize in caring for children’s teeth in a comfortable and caring environment.